Modern quilting is a new approach, a new wave, a change from traditional. Okay, so what’s traditional; common, same way all the time, could be drab, but still beautiful. The kind of fabric, the blocks, the colors, the pattern; that’s what made it traditional. It’s full (usually symmetrical). Modern quilting is your interpretation of a quilt; your rendition of what it should be. The fabric, the bold colors, the pattern (skewed and asymmetrical), the block (changed, sliced and diced), that’s what makes it modern. It’s minimal. It’s out of the box. It’s environmental. It’s YOU! 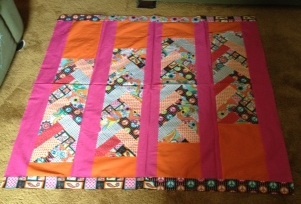 I still like making traditional quilts. However, I’m moving towards the modern quilting trend. This is my definition and observation of modern quilting. The quilt top below is my first attempt to modern quilting. What’s your thoughts on modern quilting?